ALBANY, 03/18/14 -- State Senator James L. Seward (R/C/I – Oneonta) met Tuesday afternoon in Albany with American Legion representatives from Schoharie County during the American Legion Department of New York annual legislative day. 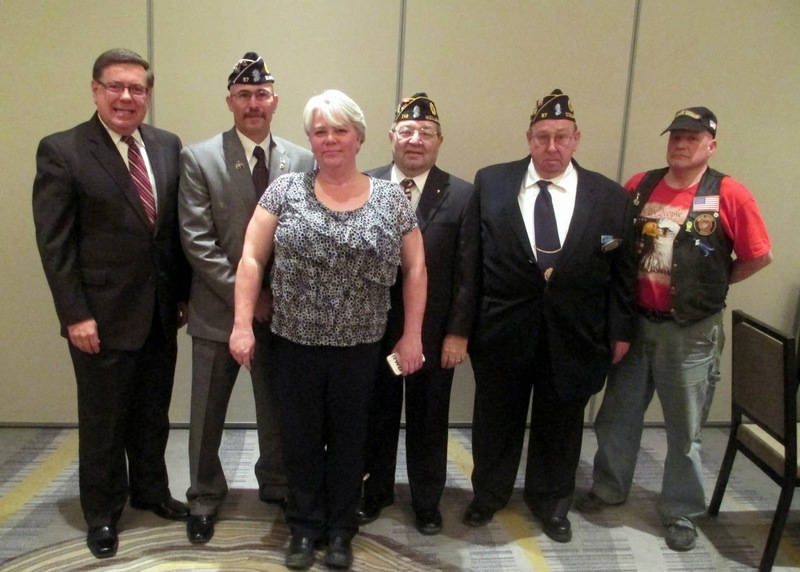 From left, Senator James L. Seward, Schoharie County Commander Gary Schacher, Schoharie County Veterans’ Service Officer Eilene Fisher, Michael Saccento (Middleburgh Post 248), Myron Kniskern (Cobleskill Post 57), Paul Todd (Sharon Springs Post 1269). Senator Seward is a co-sponsor of the “NY Jobs for Heroes Program” which passed the senate overwhelmingly earlier this year. The legislation, which is among the American Legion’s priority bills, creates a state contract preference for service-connected disabled veteran owned small businesses. “The ‘NY Jobs for Heroes Program’ will mean careers and new opportunities for our returning disabled veterans and their families. After sacrificing to protect and secure the American Dream our brave servicemen and women should be able to realize that dream themselves,” Seward added. The American Legion is also calling for the repeal of the NY-SAFE act. Senator Seward is a co-sponsor of multiple senate bills that would repeal the NY-SAFE Act and additional legislation that would repeal the anti-gun provisions of the law, but leave in place stricter penalties for crimes committed with firearms and measures to deal with the dangerously mentally ill.
“I voted against the NY-SAFE Act because it is an extreme measure which punishes law abiding citizens like our veterans while failing to confront the root causes of gun violence. I proudly stand with the American Legion in opposition to this act which infringes on the very rights they fought to defend,” Seward concluded.